For last month’s feature in National Geographic about the ancient Cambodian metropolis of Angkor, a team of Monash University faculty created a detailed digital animation of the city and its surroundings. Continuing a long running collaboration with the University of Sydney’s Greater Angkor Project, these animations attempt to visualise, and animate, the landscapes and daily life in 13th Angkor, Cambodia. The scenes draw upon a wide range of archaeological and historical data, including bas reliefs (pictorial sculptures), Chinese eye witness accounts, and extensive mapping undertaken by the Greater Angkor Project and the EFEO. Digital recreations of this kind are becoming more prevalent, as technology enables new tools for humanities research, and new funding programs like NEH’s Digital Humanities make virtualization projects possible. 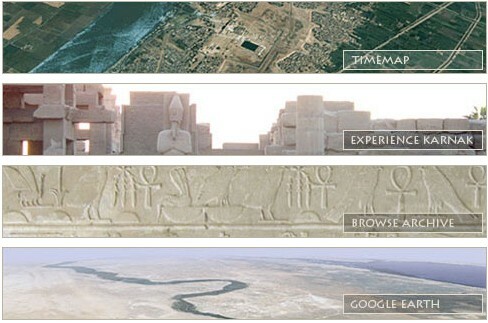 One project funded by this program is Digital Karnak, a project undertaken by a team at UCLA that recreates a religious complex built by Queen Hatshepsut in ancient Egypt. Their model goes a few steps further than the Angkor project as it documents the physical structure of the temple over two thousand years so that you can see how it was added to and modified by successive pharaohs. The result of two years of painstaking research by a team of more than 24 scholars and technicians, Digital Karnak explores how scores of existing ruins may have originally looked and demonstrates how they came to be altered over time as generations of pharaohs put their stamp on the site that served as the religious center for Thebes, the Ancient Egyptian capital during the Golden Age of the Pharaohs.